Aggies R Us: Viva Las Vegas! We went to Vegas June 25 - June 30 and meet up with our friends Jason and Melissa. This was our third trip to Vegas in 6 years. Our first visit Ray flew us out their for my surprise 21st birthday gift and we stayed at the New York, New York Casino. Then, in December 2006 we went with friends Jason and Melissa and stayed at the Polo Towers. This trip we stayed at the Planet Hollywood Casino. It used to be the Aladdin Casino. It is my favorite out of all of the casinos on the strip. Ray got us upgraded to a suite with a view of the strip by doing the $20.00 bill trick. It was a very spacious room with a huge bathroom. I spent more time in the room than Ray. 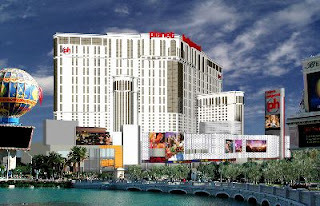 Planet Hollywood is also connected to a large shopping mall area with many shops, boutiques, and restaurants that you can walk to without ever leaving your own casino. Plus there is a little Mexican restaurant where you get the best breakfast deal in town. Ray tends to do better at this casino than any other on the Strip. Ray took $300.00 to play with and came back with $1800.00 not including the $300.00 of playing money. He had a great time playing with Jason. They both entered a poker tournament and Ray stayed in the longest this time; Jason stayed in their last tournament longer when we went in December 2006. When I would call it a night around 11:00 p.m. he would continue on into the wee hours of the morning. I did play a bit more this time around. I try to play a bit more with each trip. I think I'm starting to make Ray proud with my knowledge of the gambling world since he grew up with poker as a constant at every family function and holiday event. We had a wonderful time! It was great to get away from home and just focus on the two of us for a change. We saw the "O" Cirque Du Soleil show, David Copperfield magic show, Wayne Brady comedy show, and tried to go to all the casinos that we have not been to or the ones that Ray does not have a $1.00 poker chip from. He is now collecting those and has a total of 49 in his collection. We meet up with Jason and Melissa at least once a day to eat lunch or dinner. We loved getting to spend time with them they have become one of the best "couple" friends that we have. We miss them since they moved away. My sweet hubby bought me a "Just Because I Love You Gift"! A lovely pair of Tiffany Somerset Hoop earrings (sterling silver). I love them! !